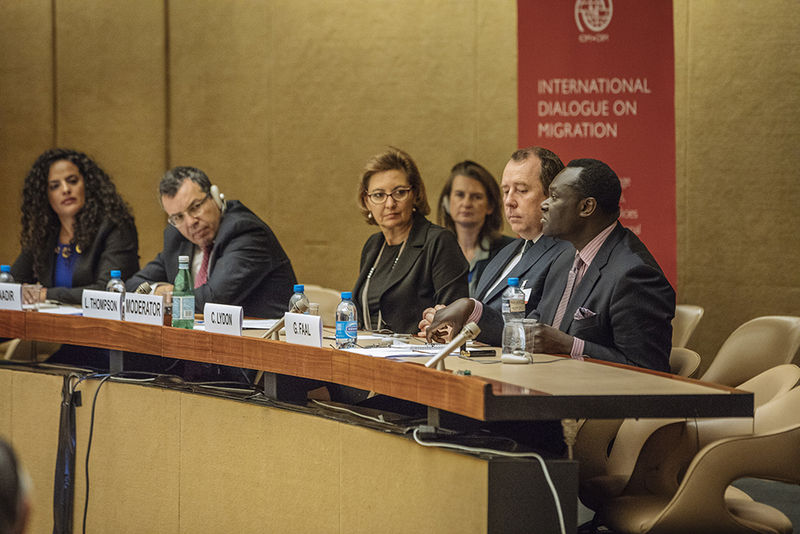 Geneva – IOM, the UN Migration Agency, officially launched its iDiaspora platform yesterday (08/09), during a side event as part the International Dialogue for Migration that is underway in Geneva. iDiaspora is a global engagement and knowledge exchange hub for transnational communities and those looking to engage with them. To reflect the global nature and diversity of this initiative, satellite launches are being planned in Cairo, London and Washington, DC. IOM recognizes that there is mounting evidence regarding the important role that diaspora members and transnational communities play towards achieving the Sustainable Development Goals in countries of origin and destination. Diaspora contributions vary in type and scope, and range from skills, knowledge and know-how transfer to investment, entrepreneurship and trade. Diaspora communities too are increasingly becoming more cognizant of their role, as evidenced by a multiplicity of diaspora organizations, associations, and confederations at the local, national and international levels. In launching the platform, the organization hopes to provide an all-in-one space for diaspora individuals, their organizations and partners to interact and exchange ideas as they work towards their shared development goals. Users can register on the site – idiaspora.org – using Facebook, Google+, or LinkedIn, or complete their profiles with their name, location, fields of expertise, interest and a photo. They help shape the platform and can take advantage of it to Connect, Learn and Contribute: by finding other like-minded users from their community or other communities with whom to collaborate, using and/or contributing to the growing repository of resources, identifying concrete opportunities to give back their skills and resources and actively participating in development of their home and host communities. The launch event (entitled Reaching out to Diaspora via Technology) was moderated by IOM Deputy Director General Laura Thompson. El Habib Nadir, Ministry in Charge of Moroccans Living Abroad and Migration Affairs and Chair of the GFMD; Colman Lydon, Vice President of Strategic Partnerships at Everwise and member of the iDiaspora Advisory Board; Honey Thaljieh, Corporate Communications Manager at Fédération Internationale de Football Association (FIFA); and Gibril Faal, LSE Visiting Professor in Practice and ADEPT Special Adviser comprised the rest of the panel and spoke during the session. "The early development phase of the iDiaspora platform serves as a great example of collaboration across multiple disciplines, effectively mining the expertise of the IOM team, as well as leaders in the global academic and business communities,” said Lydon. “Given the ubiquity of modern software platforms, capable of engaging large numbers of people, the exciting iDiaspora initiative can flourish in service to diaspora constituents, in a new and purposeful way." iDiaspora will continue to grow and respond to the needs and priorities of its online community of users. As an evolving and dynamic online space, the site hosts a survey to collect feedback that developers and the iDiaspora team can use to improve the platform progressively. In addition, an Advisory Board consisting of recognized diaspora leaders and specialists from diverse backgrounds in academia and private and public sectors was set up to advise on conceptual, operational and content areas of the platform and ensure the sustainability of the initiative. "Diasporas are inherently efficient in poverty reduction at a micro-level,” said Faal. “Substantive and substantial institutional engagement and partnerships enable scalability, replication and enhanced macro-level development impact." IOM assumes the coordination role for iDiaspora to further its development and operationalization, given its leadership in the area of diaspora engagement since the 2013 Ministerial Conference, as well as continuous engagement in capacity and partnership development on migration and development. In the last five years, IOM has globally supported more than 150 diaspora mappings and surveys. In 2017 alone, more than 70 IOM country offices supported governments on how to effectively enable, empower and engage with their diaspora. The organization will seek new partnerships with diaspora organizations, governments and private sector to ensure impact and sustainability of the platform. iDiaspora is being developed without institutional branding, to ensure equal treatment among stakeholders that work closely with diaspora communities.